So the countdown has begun. In five weeks, we will be making significant changes in the way we are the church. We will adjust our worship times to 9:30 and 11:00 here in the Sanctuary and launch a brand new worship opportunity in the Fellowship Hall. And I know that there is a significant amount of angst about how the changes are going to effect us as individuals, and ministry teams, and musicians, and Sunday School classes, and liturgists, and pastors. How are we going to all live into these changes is going to be a topic of conversation leading up to September 16th among all of us because in truth these changes are going to call on every one of us to adjust and adapt. And I suspect that there will be some who will simply choose to leave St. Luke because they are not willing or able to adapt to these changes and I am already grieving over that. In 38 years of ministry I have received hundreds into membership in the church, served thousands at the communion rail, shared messages, some good some not so good, with even more than that. I have married and buried so many that I’ve lost count. How wonderful ministry has been. But in my quiet times of prayer and reflection, those are not the people that come to mind. They are not the faces I see in my times of reflection. Not the voices I hear. No the ones that never leave me are the ones who walked away. I can see their faces and hear their voices whenever we come to times of change in the church. But at the same time I know that churches that refuse to embrace change are dying churches. And as much as I am haunted by the faces of those who have chosen to leave and will choose to leave because of the change that is coming, I am also haunted by those who have already left because we haven’t been willing to change, and by those in our community that we will never reach if we aren’t willing to change. Believe me the decision to make these changes has not come easily and without much study and thought and prayer. On the sixteenth of September I will be celebrating my sixth anniversary at St. Luke (hopefully not my last) and before I stepped into this pulpit for the first time I can tell you that I was already hearing that changes needed to be made. Here’s what I heard back then. 8:30 is too early to start the first service. Attendance, particularly at the 9:45 service, is declining. And we don’t like to get out of church after 12:00. And over these last six years those voices for change have been very consistent and in some cases growing louder. But in God’s timing, it just didn’t seem the right time to make the changes. Until now. And now that the decision has been made, I, quite frankly, can’t wait for the 16th of September to come and see what God has in store for St. Luke. Making changes is always risky business in the church, but the reason that St. Luke has thrived over the last 42 years is because you have been a risk taking church, willing to step out in faith, in the name of Jesus. And it has worked to God’s glory. So as we prepare to make this leap of faith in a few weeks, I thought it might be good for us to take some time to just talk about worship – the whys, why nots, and hows – in these weeks leading up to September 16th. Sometime ago, the USA Today newspaper did a poll among church people, and asked why they attended church, and I found the results to be quite shocking and telling at the same time. (Take a moment to answer the question that is at the top of the Tool Box – Why did you come to worship today?). In the USA Today poll, by far the largest group of responders, 45% of those polled, said they went to church “because it was good for them.” And then in declining numbers people responded that they went to serve others, and some percentage said they went for the fellowship/companionship, and another group said they went for strength/encouragement. Now those responses were certainly not that shocking, but what was shocking was the response that wasn’t shared enough to even appear in the survey. What I found shocking was that a statistically insignificant number of people responded that they went to church to worship God. Now I’m not sure why I found that to be so shocking though. When church experts now say that a person is considered a regular attender in worship if they attend a service at least once a month and that according to one poll I saw recently in the last ten years church attendance in the United States has dropped from an average right around 50% of the population on any given Sunday to now an average of 22%. And yet, while worship attendance is declining across the whole church, polls still show that 90% or more people say that they believe in God. It seems to me that all of this indicates that there is a major disconnect in the church around why we worship in the first place and that before we make any changes in how we worship or when we worship, we need to spend some time thinking about Why we worship. So quickly here we go. First, Worship is all about God. And God is all about worship. In fact scripture is clear that God created us to worship Him. The Psalmist says “worship the Lord, for it is He who made us and we are His. So enter into His presence with Thanksgiving and praise. Scripture talks a lot about worship. According to one study Bible there are 8,629 references to worship in the Old and New Testament. Now to put into perspective the importance that God places on worship, consider this. There are about 600 references to love in the Old and New Testament. There are 420 references to sin in the Old and New Testament. There are 65 times when references are made to forgiveness. And there are about 1000 references to Jesus the Messiah in the Old and New Testament. The first four of the Ten Commandments that God gave to Moses had to do with worship. The first says that we are to worship God alone. That beside God there are no others. The second commandment says that we are not to make idols of anything else on earth that we bow down to worship instead of God and to do so is sin. Place nothing else before God. The third commandment says that we are to exalt the name of God always and never take it in vain. The Psalmist goes on to say “Praise his name for His love endures forever.” And then the fourth commandment establishes the Sabbath, not primarily as a day of rest as many of us think but rather as a day of worship. The commandment says that we are to remember the “Sabbath by keeping it Holy.” In other words it is in worship that we are to find our rest and rejuvenation. Now some of you take that literally and interpret the commandment to mean that you should sleep during worship, but that’s not what it means. In the story of creation, when God first established the concept of Sabbath we are told that God spent six days creating the Heavens and earth. And then on the seventh day He rested. But here’s what we often don’t understand. God did not use the Sabbath to rest up and prepare for another period of creation. No, the Sabbath was intended as a day of praise and celebration for the completed work of creation. Six days to create the universe and then one day to celebrate creation. God’s rest is in the celebration. The Sabbath was established as a day for Holy celebration. A day of worship. To find our rest in the Holiness, the awesomeness of God. By worshiping Him. And then God concludes His story in the Book of Revelation with long passages describing the worship that will take place in Heaven. In fact He makes it clear that after everything of this world has passed, after all the trials and tribulations and distractions of this earthly life have passed, what will be left is worship forever and ever. Indeed, scripture says that EVERY knee shall bow – every tongue confess that Jesus is Lord and Savior. Now that is certainly intended as a goal for the church to work towards, but the reference is really to what will go on in Heaven. Everyone will worship constantly. Now that’s not to say that everything else we do in the church is not important, but rather that the most important thing we do in the church is worship. And then secondly, scripture tells us that worship is not something we do, but rather it is something we are to become. God did not create us for the church, but rather He created the church for us – as the place where every person can be who we were created to be. I love what Max Lucado writes in his book The Eye Of The Storm: We hear a lot about “worship” – but what is it exactly? 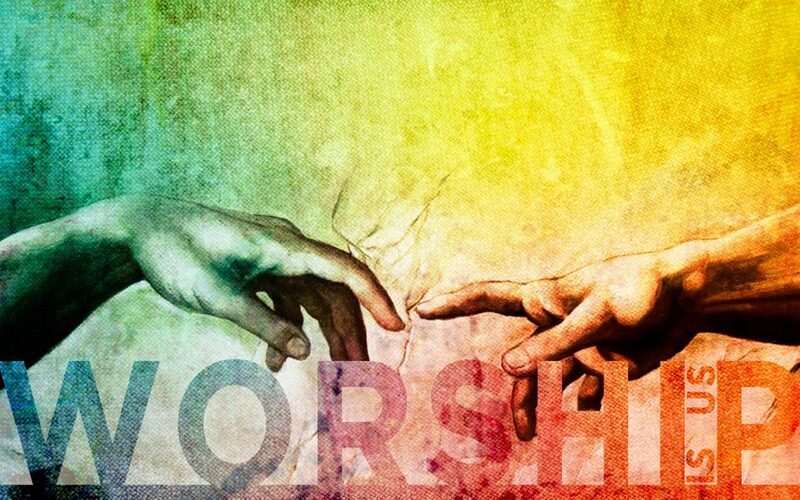 Worship is when you’re aware that what you’ve been given is far greater than what you can give. Worship is the awareness that were it not for God’s touch, you’d be hobbling and hurting, bitter and broken. Worship is the thank you that refuses to be silent. Oh we’ve tried to make a science or an art form out of worship but we can’t do that anymore than we can “sell love” or negotiate peace. Worship is a voluntary act of gratitude offered by the saved to the Savior, by the healed to the Healer, and by the delivered to the Deliverer. In other words, just as we were created to be love to everyone, rather than just offer love to those we choose, and to be a peaceful presence rather than just work for peace, so it is that we were created to be persons who worship God continually, rather than just worship in our time and in the way we choose. Everything we are, everything we do, is in praise and Thanksgiving for what the creator God has done for us. Scripture tells us that God inhabits our worship, and so when we place limits on our worship, we are trying to limit where the Creator God can dwell in this world, whose hearts and lives He can inhabit. As Disciples, as followers, it is our task, our call, our commission to work to open up all lives for God to come and dwell. When we worship with our whole life we open up every life for Jesus Christ. And worship becomes who we are for all time and in all things, and not what we do some of the time, and only in certain ways. You see, when we categorize or compartmentalize or place labels on worship. When we start making determinations about what is and isn’t appropriate in worship, we are in essence denying God’s creative work in every person. In the book of Romans, the Apostle Paul says this about why we worship. So then, my friends, because of God’s great mercy to us . . offer yourselves as a living sacrifice to God, dedicated to His service and to pleasing Him. This is the true worship that you should offer. And then, finally, through worship God completes His creative work in us. Rick Warren goes on to say Surrendering (completely) to God is the heart of worship. It is the natural response to God’s amazing love and mercy. We give ourselves to Him in love, because He first loved us. In worship, we give all that we are for God. It’s the work He began in us when He created us, and that He completes in us when we surrender our all to Him in love and praise and worship. I know that many of you appreciate the writings of Max Lucado as I do. He has a way of saying things sometimes in a way that both convicts and inspires at the same time. In his wonderful book The Cure For The Common Life, Lucado writes this: Worship adjusts us. It lowers the chin of the haughty and straightens the back of the burdened. It bows the knees, singing to him our praise. Opening our hearts, it offers to him our uniqueness. Worship properly positions the worshiper. And oh how we need it! We walk through life so bent out of shape. Cure any flare up of commonness by setting your eyes on our uncommon King. Worship lifts our eyes and sets them “on the realities of heaven, where Christ sits at God’s right hand in the place of honor and power. We worship God because we need to. But our need runs a distant second to the true reason for worship: God deserves it. God would die for your sin before he’d let you die in your sin. So what do you do with such a Savior? You lift your life to Him in worship! So why do we worship? Those more than 8000 passages of scripture come down to this. We were created to worship. Worship is who we are, not something we do. And when we surrender to worship, we become all that God created us to be. You know when we separate all of the peripheral issues that often dominate our discussions about worship in the church, it seems to me it boils down to one question: Are you willing to surrender yourself, in order to worship God? In order that He alone be praised and worshiped in this place today and tomorrow and every day and as we move into a bold new future that God has for us. This morning this altar is open and God is searching for lives of complete surrender. Are you ready? Come let’s surrender ourselves as we worship God together.